Oscar-Winning 'Mad Max' Is Like A Big Hype Machine For Namibia's Role As An Exotic Movie Location : Goats and Soda The success of the Oscar-winning film is good for the country's film industry. But critics say the crew didn't take good care of dunes and animal habitats. 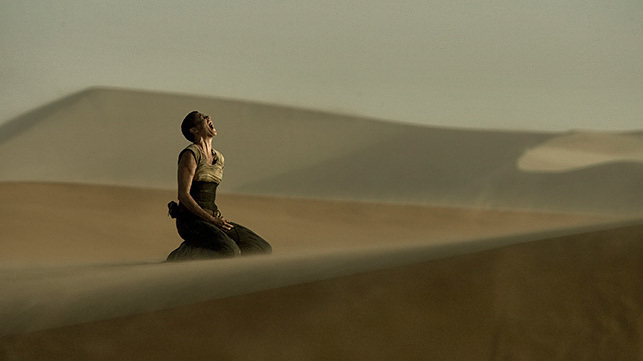 The Namibian desert plays a starring role in the Oscar-winning Mad Max: Fury Road. Crimson sand dunes, cracked desert floors, big open skies and landscapes that look like paintings — it's no wonder why Namibia was name-checked four times at the Academy Awards for helping Mad Max: Fury Road take home six Oscars — the biggest haul of the night. "It was a year of our lives in the Namibian desert," said Jenny Beavan in her acceptance speech for best costume design. "We had the most amazing crew." For Obed Emvula, chairman of the government-run Namibia Film Commission, the Oscar buzz was music to his ears. Since Mad Max premiered in Cannes last May, his group, which coordinated locations for the film when it was shot in 2012, has seen an increase in inquiries from global film companies. So he's working hard to bring the local film industry up to world-class standards. "American companies now know that there is a place like Namibia," he says. In fact, the southwestern African country is no stranger to Hollywood. Its towering dunes in Southern Namib, its moonlike rock formations in the Namib Escarpment and the bottomless Fish River Canyon, the second largest canyon in the world, have been used as set locations for feature films like 2001: A Space Odyssey from 1968, The Cell from 2000 and 10,000 B.C. from 2008. 10,000 B.C. is another Hollywood movie that showcases Namibia's scenery. "Namibia is an unknown and virgin territory," says Emvula. "It's the perfect setting for film." Aside from the country's stunning landscapes, it has the infrastructure to welcome huge casts and crews, says Emvula. There are five-star hotels with Internet access within 30 minutes of some of the most striking scenery in the coastal areas. Films can shoot almost any time: there are 300 days of sunshine a year. And because the country has only 2.3 million people (compare that to Nigeria's 177 million) it's easier to get shots of the natural environment without people in them. There was an uptick in U.S. films shot in Namibia in the early 2000s, but interest slowed because of the global recession — it's expensive to film abroad. And other exotic locales became popular. The desert scenes in Star Wars: The Force Awakens, were shot in Morocco, for example, while The Martian's red rocks were found in Jordan. To stay competitive, Emvula says Namibia's film industry is working with the government to provide more incentives for international film, documentary and TV companies. This includes marketing efforts to get more movies made in Namibia and training in film production for locals. The idea, he says, is to have people who know how to work in the industry when the opportunity arrives. All of this will help increase what Emvula calls "film tourism" in an economy dependent on exporting minerals like diamonds and uranium. When a movie like Mad Max comes to town, he explains, jobs are created, hotel rooms are booked, cars are rented, fuel is purchased, restaurants are busy and retail shops sell goods. In 2012, the Guardian reported that the film brought in more than $38 million, employing about 900 local staff. "Locals benefit by getting jobs, which means they can then pay taxes and send their kids to the dentist and give their money to church," says Emvula. "The economy booms when a film comes." As inviting as all the incentives are, there are some downsides. Although Namibia is an upper-middle income country, half the country lives below the poverty line. That means labor costs are cheap — but there's no union to protect these workers or stop crews from filming around the clock. And there's been concern about environmental damage caused by reckless film crews. In a letter to the Namibian government, a Namibian tour guide named Kit Collard wrote that the 800-strong Mad Max crew destroyed sensitive dune ecosystems and disrupted animal habitats in the Namib Desert in the process of filming. They go "where they want, when they want," she wrote. A leaked environmental report commissioned by the government found that public consultation prior to funding was insufficient. The film commission took out a full-page advertisement in a state-owned newspaper denying the claims. Emluva says a representative from the Ministry of Environmental Tourism ensures that landscapes are rehabilitated after being used in movie scenes, including the ones used in Mad Max. But Collard criticizes the quality. In her letter, translated from German, she writes, "Though they look good, the process has [left the landscape] even more damaged." New environmental legislation aims to protect the landscape. "It's important that whoever enters our country feels welcome while using our spectacular scenes as a backdrop," writes Marinda Stein, a Namibian filmmaker and founder of RedHot Film Productions, in an e-mail to us. "And that there's mutual respect on both ends during the production process." An earlier version of this story misstated the original language of Kit Collard's letter as Dutch. In fact, she had been writing in German.